A Liberal's Libretto: When you see the crack in the door - applaud. When you see the crack in the door - applaud. 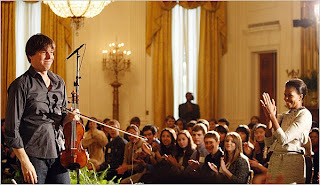 Wednesday evening, President Obama and the First Lady welcomed classical to the White House. The evening featured performances by violinist Joshua Bell, guitarist Sharon Isbin, cellist Alisa Weilerstein and pianist Awadagin Pratt, with some young student musicians sitting in. As with any event in the White House, there is certain protocol that is painstakingly lead by a team of social secretaries and stewards. It is the job of these individuals to alert the president to all of the do's and don'ts that accompany events in the most famous residence in the world. However, keeping on top of the do's and don'ts goes beyond the protocol of the White House. Sometimes, it's just sheer audience etiquette. In comments before the performance, President Obama looked back at the Kennedy White House's "Camelot" legacy of cultural involvement - albeit whimsically. Here's the insider-anecdote he shared, as relayed in a White House press office transcript of the president's remarks. "Now, if any of you in the audience are newcomers to classical music, and aren’t sure when to applaud, don’t be nervous. (Laughter.) Apparently, President Kennedy had the same problem. (Laughter.) He and Jackie held several classical music events here, and more than once he started applauding when he wasn’t supposed to. (Laughter.) So the social secretary worked out a system where she’d signal him -- (laughter) -- through a crack in the door to the cross-hall. "This is, of course, a unique concert venue. But tonight, all across America, in community centers and concert halls, in homes and in schools, the sounds of classical music are lifting hearts and spurring imagination, just as they always have. And it’s easy to understand why. There’s precision, of course; but there’s also great feeling and improvisation. There’s structure; but there’s also creativity. It’s music that defies simple definition even as it speaks to a common, universal language. "So whether you are new to classical music, or have been an aficionado for many, many years, we hope that you enjoy tonight." 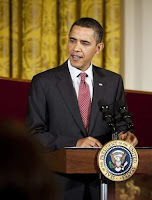 I am pleased beyond words at the fact that we now have a president in office who wholly leads our country. And to be clear, I mean that this president has the understanding that leading this country isn't only about creating war and profiteering. Leading this country also includes fostering our cultural and artistic potential and celebrating our cultural and artistic legacy.